The release of macOS 10.13.4 brings with it official external GPU support by Apple, but the company is recommending specific enclosures/chassis and cards, excluding ones some people might hope to use. In a support page posted on late Thursday, the company suggests several AMD video cards. These include the Radeon RX 570 and RX 580, the Radeon Pro WX 7100 and 9100, and finally the Radeon RX Vega 56, 64, and Vega Frontier Edition Air. Suggested enclosures come from companies like PowerColor, Sonnet, and OWC —but others can work as well. Support is not limited to any specific card vendor. As long as the card mostly complies with the reference specification, they are able to be used in an eGPU enclosure. The list notably excludes any cards from Nvidia. Nvidia does have the "web driver" for its PCI-E that it updates after every macOS revision, but at present that isn't sufficient to run the cards in an enclosure, without third-party hacks applied, and even that can be problematic. 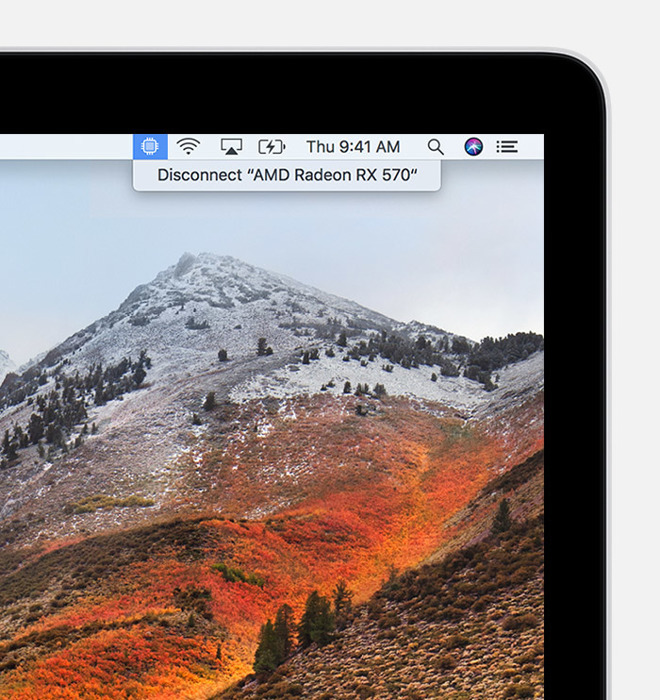 During the beta process, some cards that worked during Apple's initial testing of eGPU support are no longer supported, such as the AMD RX 560. Mac owners must also use Thunderbolt 3, since official support for earlier versions of Thunderbolt was also dropped in the beta period. Apple notes that people can connect more than one eGPU, though people should use direct connections whenever possible instead of daisy-chaining. Apple's enclosure recommendations all have 87W of charging power available to the host machine, and 13-inch MacBook Pros from 2016 or later should always have eGPUs plugged in on the left-hand side to guarantee maximum bandwidth. Any VR headsets should be plugged into the eGPU. To check whether cards are working properly, users should open the macOS Activity Monitor, then select Window and GPU History. Once a session is finished Apple notes that the new chip icon in the Mac's menu bar should be used to disconnect it. The macOS 10.13.4 update also brought with it support for Business Chat in Messages, and a variety of bugfixes, such as for graphics problems impacting apps on the iMac Pro.